ORLANDO, FL -- A Chick-Fil-A is honoring a fallen officer who died Monday in a traffic crash while assisting in a manhunt. He was looking for a man wanted for shooting and killing Orlando police Master Sgt. Debra Clayton. Norman Lewis, an 11-year-veteran of the force, was a regular at the fast food restaurant. The staff decided to pay tribute to Lewis with that they called a "Missing Man Table," draped in a white table cloth, with Lewis' framed photo, a single rose, a bible, and a candle. The table also had the empty containers for his favorite menu selection, a 12-count nugget meal with a fruit cup. 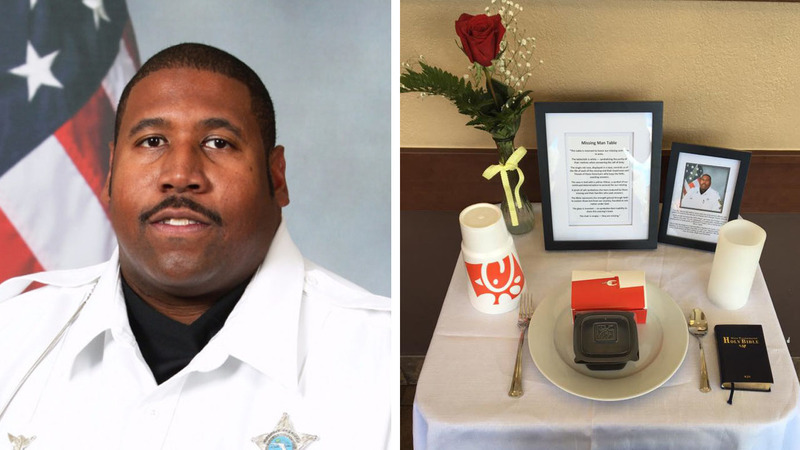 "In honor and remembrance of Orange County Deputy First Class Norman Lewis, a regular at our restaurant who's smiling face will be truly missed," the location wrote on their Facebook page. "'Thanks' is not enough for what brave men and women like Norm sacrifice for our safety every day." Lewis had served with the OSCO since 2005 and was a member of the Motors/DUI unit. He had been in the public eye in the Orlando area since playing football for the University of Central Florida. A GoFundMe page created to help his parents cover future expenses remembered Lewis as, "A friend to everyone and always had a smile on his face." Police are still searching for the suspect, Markeith Loyd, and have raised the award to $100,000 for his capture. Three people have been arrested for allegedly aiding Loyd evade authorities.